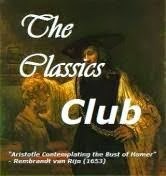 After a few years of pondering, in January 2014 I finally signed up to The Classics Club. I wasn’t at all sure that I’d really be up to (or inclined to) up my classics intake to the ten a year that would be required to meet the challenge of reading 50 books in 5 years but when I actually took a second to check in on how things were going, it turned out that I’m actually doing ok.
Out of the 50 books on my list, I’ve read 10 books. Right on target! What a handy coincidence. Out of those 10 books, I actually only physically read 3. I listened to the rest while commuting. I won’t deny that it’s been strange adjusting to “reading” in a new way. It’s been a really mixed bunch – sure, that’s largely been led by the eclectic mix of titles that my local library’s audiobook site has but it’s also because the list itself is a fairly random one. My top three were easy to choose: Villette, The Haunting of Hill House and Around the World in Eighty Days. Villette wasn’t an easy read and I wasn’t convinced by it at first but I really enjoyed it overall. Lucy Snowe makes the book. Her narration is deceptive and shifty but I loved that she spent the whole book striving for modest independence. All she wants is a stable job, financial security and somewhere of her own to live but she struggles for even that. It sounds dreary. It isn’t. It’s wonderful in its subtlety and I’m still not sure I’ve read any other book that I felt said as much about the author as this did. And the ending is perfection. The intervening pages are equally great and reading about the brooding house and its effects on its hapless inhabitants made one particularly gloomy train journey rather unsettling indeed. Around the World in Eighty Days was just fun. It’s kind of silly and is basically the story of a rich man scurrying around the world to try to win a bet. But there are ridiculous obstacles and one great big drawn out case of mistaken identity and it’s fast-paced so you should read it because it’s entertaining. Ha – too easy! Tess of the D’Urbevilles. I disliked that book so, so much. Tess drove me crazy but as frustrated as I was with her, I was roughly one thousand times more incensed by Angel, her darling husband. I couldn’t bear the main characters, there were far too many descriptions of fields (swede fields predominantly) and the ending was just…not good. Then again, I finished Tess, which is more than I can say for the oh so terrible The Pickwick Papers by Charles Dickens. That book was awful. So awful, I couldn’t face trudging through the whole million pages of it. It’s not funny, it’s not charming and it’s not interesting. It is not good. So I stopped reading it. Much though I am sure it breaks the rules, I also dropped it from my list. My intention in creating the list was to make sure I read a bit more expansively, not to make myself miserable so I’m happy with the decision. I replaced it with War and Peace so it’s not as though I’m going easy on myself. To keep up the good work, I’ll be tackling one of the longest books on my list, War and Peace, from 1st February (which is scarily soon!) as part of Hanna’ readalong – head HERE if you want to topple the Russian classic too! War and Peace Read-along: Let's go, Tolstoy!